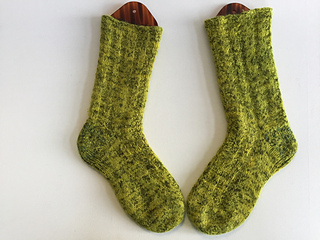 As of today De Vlotte Knot in Amsterdam sells my very first sock pattern. So Galapagos is the first. I made it easy on myself because one of the yarns I used from Zitron is called Galapagos. The second yarn I used is a Drops Alpaca is a beautiful lemon green color. For now the pattern is only available in Dutch. The pattern is written for knitting the socks on two circular needles (4 mm. 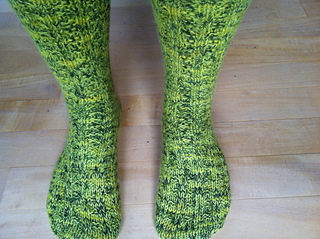 ), toe-up and with a short row heel. Footlength: 24 cm. Size 38/39. Used yarn: 50 gr. (210 meters) Zitron Trekking Handart Galapagos and 60 gr. (220 meters) Drops Alpaca Lime Green. Had my two favorite models with me this morning. So, I put them in some socks and took them outside to take some pictures. I asked them to lift their pyjama pants to get a good view of the socks. Guess who had the best view? Right. I did not plan this scene. It just happened, like it did. When I was uploading the pictures, I saw the stupid grinning gnome that somehow got in the picture. They always seem to show up at the right time, at the right place, don’t they, these little fellows?